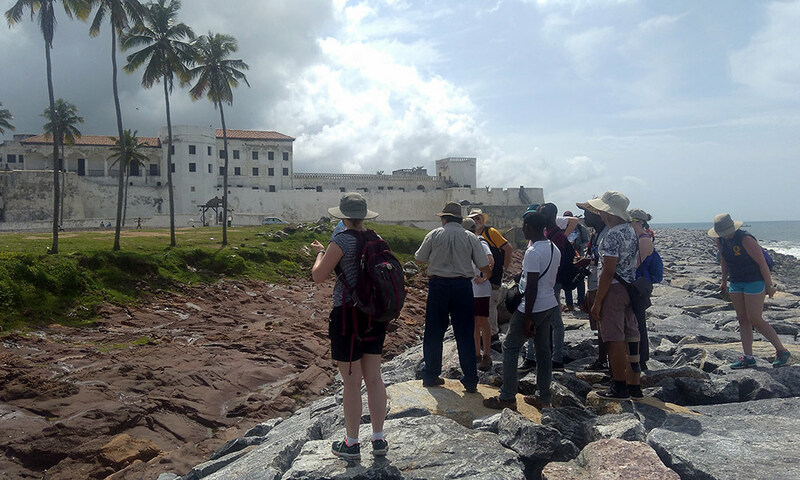 This is the second summer that University students – led by professors Renato Perucchio, Michael Jarvis, and Chris Muir – are studying the engineering, historical, and cultural aspects of the coastal forts of Ghana. They will be sharing their experiences from the field here on this blog. Discovering Ghana: Follow the stories of University of Rochester students studying the engineering, architecture, archaeology, and culture of the coastal forts of Ghana. In our group we have a little secret: we have this obsession for discovering what the centuries have hidden away from us. It is also known that pillars, walls, and arches are always ready to share details of the construction of buildings. By analyzing these structures, we hope to better understand why they were built and how they are meant to prevent an eventual collapse of the Elmina Castle. 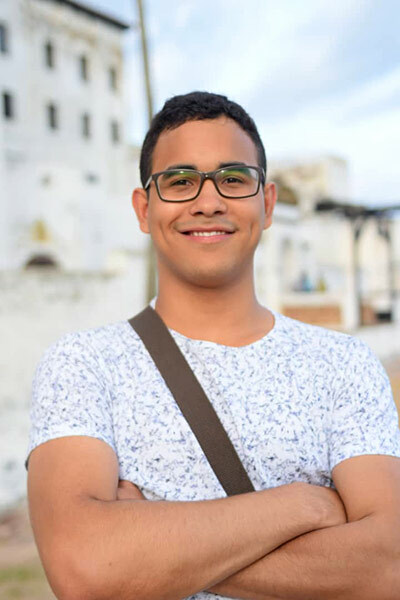 I am Marcos dos Santos, a mechanical engineering rising junior and I love imagining what the past was like from looking at historical pieces. The combination of sea breeze, sand, and sunlight has always been the stage for the happiest moments of my life. My hometown of Salvador, Brazil has a past that confuses with the sad past that Ghana and so many other countries went through for hundreds of years. The slave trade shaped the culture and infrastructure of places like Elmina and even my hometown. 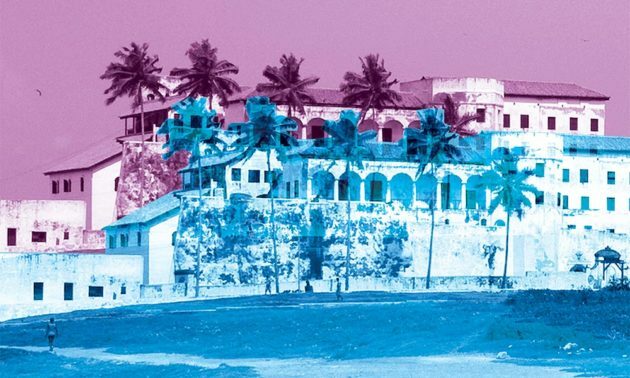 Since arriving at Elmina, my heart has been flooded with sorrowful thoughts that fly back to the colonial period, when elegant pieces of architecture such as Elmina Castle were built to house pillaged materials such as gold and ivory, as well as human beings. The town of Elmina is now populated by people who have been indirectly affected by the hundreds of years in which the whole coast of Ghana (then the Gold Coast) was exploited by explorers who were not concerned at all about the consequences of their acts in later years. The rooms of Elmina Castle feature two different sides of human intelligence: one that is persistent and sadistic, and the other that is rational and obsessed with elegance. Although worth writing a book on it, the first side of the human intelligence will not be part of my post. I want to share with you my experience in how we have examined the rooms of the castle. It all boils down to observing, interpreting, and measuring the dimensions of the rooms and structural components of the monument. Our main goal in determining the dimensions of the castle is to better understand how to preserve it. 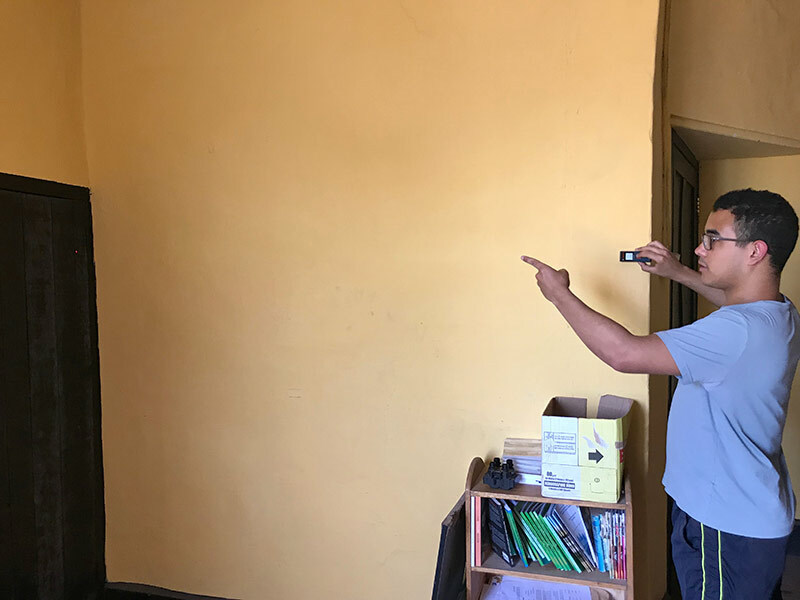 Surveying a single room, depending on its size, normally takes three students. One to make a sketch of the room (as shown above), another to measure dimensions, and the other to note down the values. The process may take three hours. As we get ingrained in the work, we lose our sense of time and dehydration kicks in. Drinking several gallons of water during the day is essential to staying healthy. It is a tiring process, but by the end of the day we all are satisfied with the work that we do, especially because we learn many techniques as we go through this process. Once we have the dimensions of the rooms, we then start the process of making a solid model of the castle using a software called NX. The solid model is a virtual, three-dimensional representation of the castle. 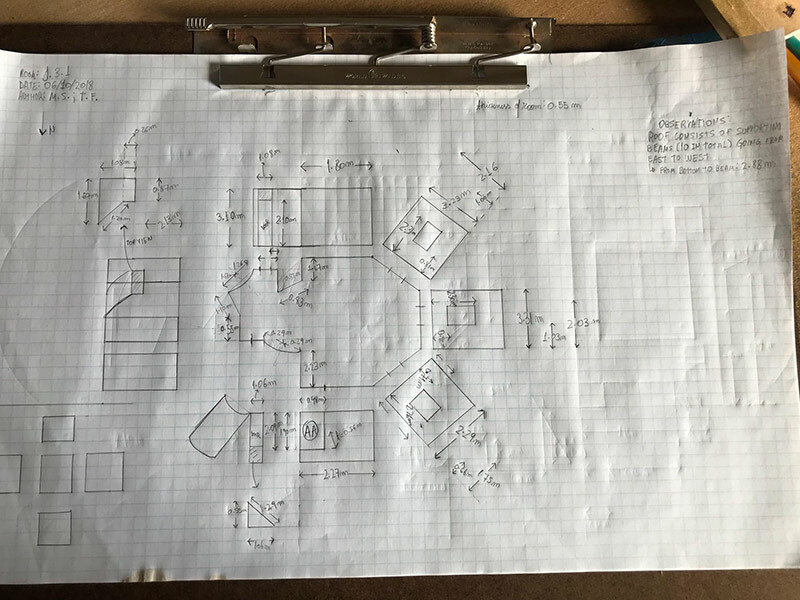 With that in hand, we can then do the finite element analysis of the rooms to visualize what parts of the castle are most susceptible to collapsing should an earthquake take place, for instance. For the engineering students, it is most valuable to learn to operate the software as we try to better understand the structure. Another technique we use to digitally document the castle is called photogrammetry. As the images above show, a digital representation of the structure is created after hundreds of pictures are taken at different angles and positions of the room. This technique allows us to have access to a highly detailed representation of the rooms anytime and anywhere. The process of surveying the castle is key to the conservation and preservation of this UNESCO monument. Sometimes, the survey process naturally pushes the horrendous past of slavery and European exploitation to the side. And yet, it is impossible to forget the suffering that some caused for many generations in the wonderful land today called Ghana. 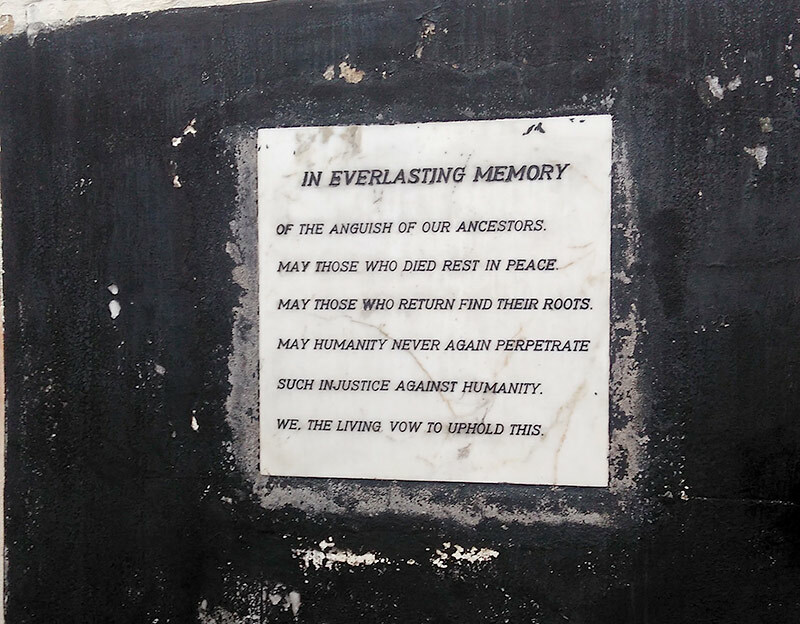 Preserving Elmina will be fundamental in reminding the younger generations of all nations that what some of our ancestors did should not be repeated ever again. Helping preserve the castle to me is an honorable mission.